Ferdinand I (Ferdinand Viktor Albert Meinrad; 24 August 1865 – 20 July 1927), nicknamed Întregitorul ("the Unifier"), was King of Romania from 1914 until 1927. Although a member of Germany's ruling Hohenzollern imperial family, Ferdinand sided against the Central Powers in World War I. Thus, at the war’s end, Romania emerged as a much-enlarged kingdom, including Bessarabia, Bukovina and Transylvania, and Ferdinand was crowned king of ‘Greater Romania’ in a grand ceremony in 1922. He died from cancer in 1927, succeeded by his grandson Crown Prince Michael under a regency. Prince Ferdinand Viktor Albert Meinrad of Hohenzollern-Sigmaringen was born in Sigmaringen in southwestern Germany. The name was later shortened simply to Hohenzollern after the extinction of the Hohenzollern-Hechingen branch in 1869. The princes of Hohenzollern-Sigmaringen had ruled the principality until 1850, when it was annexed to Prussia. Ferdinand I was the son of Leopold, Prince of Hohenzollern-Sigmaringen, and Infanta Antónia of Portugal (1845–1913), daughter of Queen Maria II of Portugal and Prince Ferdinand of Saxe-Coburg and Gotha, heir to the Slovakian-originated Hungarian magnates of Kohary on his mother's side. Following the renunciations, first of his father in 1880 and then of his elder brother Prince Wilhelm of Hohenzollern-Sigmaringen in 1886, young Ferdinand became the heir-presumptive to the throne of his childless uncle, King Carol I of Romania, who would reign until his death in October 1914. In 1889, the Romanian parliament recognized Ferdinand as a prince of Romania. The Romanian government did not require his conversion to Eastern Orthodoxy from Catholicism, as was the common practice prior to this date, thus allowing him to continue with his born creed, but it was required that his children be raised Orthodox, the state religion of Romania. For agreeing to this, Ferdinand was excommunicated from the Catholic Church, although this was later lifted. Ferdinand's mother's first cousin Tsar Ferdinand I of Bulgaria sat on the throne of the neighbouring Bulgaria beginning in 1887, and was to become the greatest opponent of the kingdom of his Romanian cousins. The neighboring Emperor Francis Joseph, monarch of Austria-Hungary and as such, ruler of Transylvania, was Ferdinand's grandmother's first cousin. Ferdinand, a complete stranger in his new home, started to get close to one of Queen Elisabeth's ladies in waiting, Elena Văcărescu. Elisabeth, the Queen consort of Romania, very close to Elena herself, encouraged the romance, although she was perfectly aware of the fact that a marriage between the two was forbidden by the Romanian constitution (according to the 1866 Constitution of Romania, the heir-presumptive to the throne was not allowed to marry a Romanian). The affair caused a sort of dynastic crisis in 1891. The result of this was the exile of both Elisabeth (in Neuwied) and Elena (in Paris), as well as a trip by Ferdinand through Europe in search of a suitable bride, whom he eventually found in Queen Victoria's granddaughter, Princess Marie of Edinburgh. 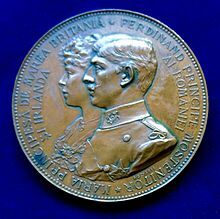 In Sigmaringen on 10 January 1893, Prince Ferdinand of Romania married his distant cousin, the Lutheran Princess Marie of Edinburgh, daughter of Anglican Prince Alfred, Duke of Edinburgh, and the Orthodox Grand Duchess Marie Alexandrovna of Russia. Marie and Ferdinand were third cousins in descent from Franz Frederick Anton, Duke of Saxe-Coburg-Saalfeld. Marie's paternal grandparents were Victoria of the United Kingdom and Prince Albert of Saxe-Coburg-Gotha. Her maternal grandparents were Alexander II of Russia and Marie of Hesse and by Rhine. The reigning Emperor of the neighbouring Russia, at the time of the marriage was Marie's uncle, Tsar Alexander III, who would be succeeded by his eldest son, Marie's cousin, Tsar Nicholas II, the following year. The marriage produced three sons: Carol, Nicholas and Mircea (one of whom, Mircea, died in infancy) and three daughters: Elisabeta, Maria (Mignon) and Ileana. The marriage was unhappy and the couple's two youngest children, Ileana and Mircea, are generally acknowledged to have been sired by Marie's long-time lover, Barbu Știrbey. Ferdinand succeeded his uncle on the latter's death (Carol I died without surviving issue) as King of Romania on 10 October 1914, reigning until his own death on 20 July 1927. He was the 1,174th Knight of the Order of the Golden Fleece in Austria in 1909 and the 868th Knight of the Order of the Garter in 1924. 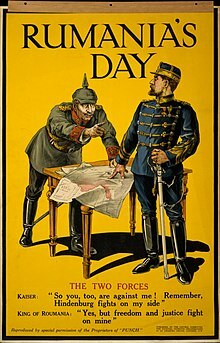 Though a member of a cadet branch of Germany's ruling Hohenzollern imperial family, Ferdinand presided over his country's entry into World War I on the side of the Triple Entente powers against the Central Powers on 27 August 1916. Thus he gained the nickname the Loyal, respecting his oath when sworn in before the Romanian Parliament in 1914: "I will reign as a good Romanian." As a consequence of this "betrayal" toward his German roots, Kaiser Wilhelm II had Ferdinand's name erased from the Hohenzollern House register. Despite the setbacks after the entry into war, when Dobruja and Wallachia were occupied by the Central Powers, Romania fought in 1917 and stopped the German advance into Moldavia. When the Bolsheviks sued for peace in 1918, Romania was surrounded by the Central Powers and forced to conclude the Treaty of Bucharest, 1918. However, Ferdinand refused to sign the treaty. When the Allied forces advanced on the Thessaloniki front, they knocked Bulgaria out of the war, and Ferdinand ordered the re-mobilization of the Romanian Army. Romania re-entered the war on the side of the Triple Entente. The outcome of Romania's war effort was the union of Bessarabia, Bukovina and Transylvania with the Kingdom of Romania in 1918. Ferdinand became the ruler of a greatly enlarged Romanian state in 1918–1920 following the Entente's victory over the Central Powers, a war between the Kingdom of Romania and the Hungarian Soviet Republic, and the civil war in Russia. He was crowned as king of "Greater Romania" in a spectacular ceremony on 15 October 1922 at the courtyard of the newly opened "Coronation Cathedral" in the historic princely seat of Alba Iulia, in Transylvania. A new period of Romanian history began on the day of the Union of Transylvania with Romania (Great Union Day, Marea Unire). This period would eventually come to an end with the international treaties that led up to World War II. These ceded parts of Romania to its neighbors. As such, they are widely seen as an attempt to provoke the country into taking sides and joining the war. Domestic political life during his reign was dominated by the conservative National Liberal party led by the brothers Ion and Vintilă Brătianu. The acquisition of Transylvania ironically enlarged the electoral base of the opposition, whose principal parties united in January 1925 – October 1926 to form the National Peasant Party. Ferdinand died from cancer in Sinaia in 1927, and was succeeded by his grandson Crown Prince Michael, under a regency. The regency had three members, one of whom was Ferdinand's second son, Prince Nicholas. ^ "Ferdinand I". Retrieved 28 March 2013. ^ "The Royals: King Ferdinand I". Archived from the original on 4 May 2013. Retrieved 28 March 2013. ^ Julia Gelardi (2005). Born to Rule, Granddaughters of Queen Victoria, Queens of Europe. Headline Book Publishing. pp. 91–93&115. ISBN 0-7553-1392-5. ^ Pakula, Hannah (1985). The last romantic: a biography of Queen Marie of Romania. London: Weidenfeld & Nicolson. p. 337. ISBN 0-297-78598-2. ^ "Marea Unire de la Alba Iulia - 1 Decembrie 1918". cimec.ro. Archived from the original on 18 March 2014. Retrieved 7 December 2014. ^ Duțu, A.; Institute for Operative-Strategic Studies and Military History; Alexandrescu, I. (1997). Romania in World War II, 1941-1945. Publishing House Sylvi. ISBN 9789739175241. Retrieved 7 December 2014. ^ "King Ferdinand I". Retrieved 28 March 2013. ^ "Flickr". m.flickr.com. Retrieved 7 December 2014. ^ "Pin by Sandbeard on Beards & Moustaches | Pinterest". pinterest.com. Retrieved 7 December 2014. ^ "wp-content/uploads/2012/05/After-the-death-of-King-Charles-2". only-romania.com. Retrieved 7 December 2014. ^ "crown-prince-ferdinand-of-romania-bprince-og-hohenzollern | Diana Mandache's Weblog". royalromania.wordpress.com. Archived from the original on 21 December 2014. Retrieved 7 December 2014. ^ "Poster Showcase : King Ferdinand I of Romania - Official Website of PosterShowcase.info | Arts, Posters and More..." postershowcase.info. Archived from the original on 9 November 2014. Retrieved 7 December 2014. ^ "Toison Autrichienne (Austrian Fleece) - 20th century" (in French), Chevaliers de la Toison D'or. Retrieved 2018-11-30. ^ Jørgen Pedersen (2009). Riddere af Elefantordenen, 1559–2009 (in Danish). Syddansk Universitetsforlag. p. 468. ISBN 978-87-7674-434-2. ^ "wikipedia/commons/9/9c/Ferdinand_Crown_Prince_of_Roumenia_1895_Uhlenhuth". upload.wikimedia.org. Retrieved 7 December 2014. ^ "King Ferdinand I from the first visit in Country to his death | Only in Romania". only-romania.com. Retrieved 7 December 2014. ^ "Pin by Gina Hommer on Royalty through the years! | Pinterest". pinterest.com. Retrieved 7 December 2014. ^ "National Portrait Gallery - Large Image - NPG x129715; King Ferdinand of Romania". npg.org.uk. Retrieved 7 December 2014. ^ "Knights of the Garter created during the reign of King George V (1910-1936)" Archived 7 August 2018 at the Wayback Machine, Cracroft's Peerage: The Complete Guide to the British Peerage & Baronetage. Retrieved 2018-11-30. ^ "Crown Prince Ferdinand of Romania. | Romania | Pinterest". pinterest.com. Retrieved 7 December 2014. ^ "- Person Page 10096". thepeerage.com. Retrieved 7 December 2014. ^ "Ferdinand I was King of the Romanians from 10 October 1914 until his... News Photo 481655603 | Getty Images". gettyimages.co.uk. Retrieved 7 December 2014. (in Romanian) Wolbe, Eugen:Ferdinand I – Întemeietorul României Mari (Ferdinand I, founder of Greater Romania), Humanitas, 2006.